Harriet Byron McAllister was born in Greensborough, Georgia on April 17, 1798. She came to the Delta as the bride of Colonel William Whitaker Blanton after their marriage on March 26, 1818. 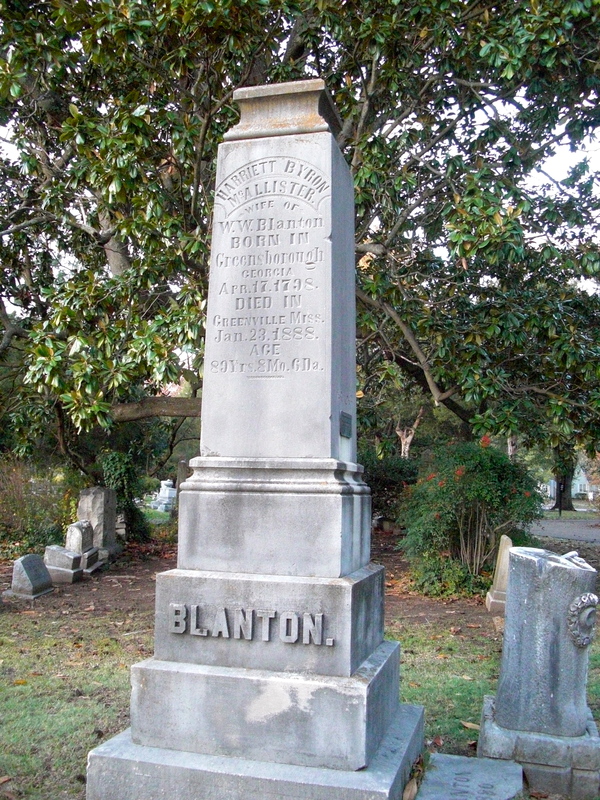 Their home was known as Blantonia Plantation. After Colonel Blanton’s death in 1838 Harriet married Dr. Samuel Theobald on June 27, 1841. Following the burning of Greenville by Federal Troops during the Civil War, Harriet Theobald donated a portion of Blantonia Plantation to rebuild the town, earning her the nickname “Mother of Greenville.” She died in Greenville on January 23, 1888. This entry was posted in Greenville History, Historical Figures by greenvillecemetery. Bookmark the permalink.